vielen Dank für die Info bezüglich des webinars zum Thema Immunocytochemistry. 'Immunohistochemistry' (edited by S. Renshaw), ISBN: 978-1-904842-03-3. Hätten Sie das noch auf Lager? Könnten dann nämlich unseren OTOferlin Ak ab53233 und den Cy3 donkey anti rabbit den wir von Ihnen haben nochmal ausprobieren.Beim 1.Mal ist etwas schief gegangen und die Fbg. war leider nicht so gut geworden. Ein IHC Webinar wurde bereits im Juni 2011 gehalten. Sie koennen es sich auf unserer Webseite unter https://www.abcam.com/blog/ oder https://www.abcam.com/blog/index.cfm/Webinars anschauen. Das Buch "Immunohistochemistry" ist verfuegbar als ab94964 fuer ein Preis von €50.00 + Lieferkosten. Falls Sie weitere Fragen haben oder der Antikoerper ab53233 Ihnen weiterhin Probleme bereitet, sagen Sie mir bitte Bescheid. I would like to take yo up on your offer to purchase and try the otoferlin antibody on zebrafish and obtain the discount code. 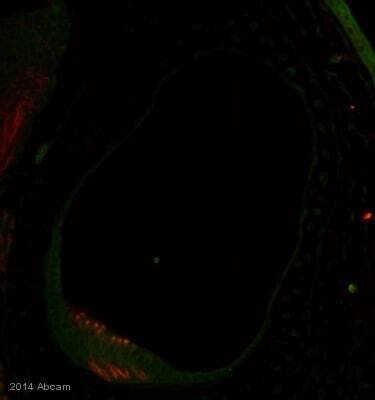 I am very pleased to hear you would like to accept our offer and test ab53233 in zebrafish. This code will give you 1 free primary antibody before the expiration date. To redeem this offer, please submit an Abreview for zebrafish and include this code in the “Additional Comments” section so we know the Abreview is for this promotion. For more information on how to submit an Abreview, please visit the site: www.abcam.com/Abreviews. Thank you for contacting us. Because we carry over 80,000 products, it isn't feasible for us to keep small sample sizes of our products. To our knowledge, ab53233 has not been tested in zebrafish yet. 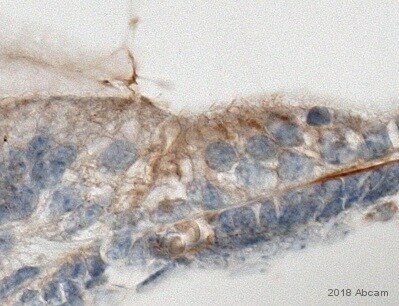 However, the immunogen reveals a sequencesimilarity of 73% and therefore this antibody might cross-react.Thus, I can offer a discount off a future purchase if you buy ab53233 now, test it in zebrafish and submit feedback to us in the form of an Abreview. It doesn’t matter whether the Abreview is positive or negative, we would just really like to receive your feedback. The discount would be to the value of 1 free primary antibody. 1. Reply to this e-mail to let me know that you would like to proceed and test ab53233 in zebrafish. I will then send a discount code. This code must be issued before purchasing ab53233 so please wait for my reply before ordering. 2. Purchase ab53233 either by phone, fax, or online (www.abcam.com). We are always pleased to obtain feedback about our products and any information is greatly appreciated! Even if ab53233 turns out to be unsuitable for zebrafish, you will still receive the discount on your next purchase after your Abreview has been submitted. Also, please find on our website (https://www.abcam.com/zebrafish) and attached a list of all our antibodies which we guarantee to work with zebrafish. Thank you for your inquiry. The immunogen this antibody was raised against is a tagged fusion protein, corresponding to amino acids 1-395 of Human Otoferlin. (Immunogen section on the datasheet). We are not aware that the epitope that is recognized by this antibody was specifically mapped or further narrowed down. I am sorry that I could not provide you with the requested information on this occasion.